Jaylen Brown is not screwing around. The man means business, even off the court, as often as he and Jayson Tatum get buckets (which is to say 24/7 for the uninitiated). 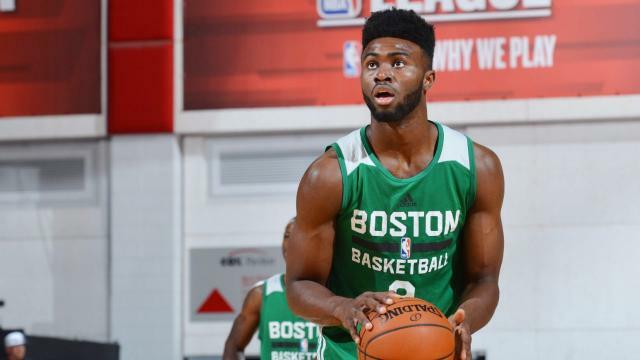 The second-year Boston Celtic, who notably took to negotiating his rookie deal with the help of advisors supplied by an NBA Players Association he hopes to one day lead, has been vocal in his leadership of the Celts' Summer League team, and took things a step further by hosting an event for underage players at the Las Vegas Summer League. "There are a lot of young guys here, and there is nothing to do in Vegas if you’re under 21 ... I just want to do something. Hang out, talk to them. Build relationships. I’m not 21. Jayson [Tatum] is not 20. A lot of the draft picks are young ... I’m going to let them bring whoever they want. Food is on me. Everything." This is exactly what you want to see from a player clearly being regarded as a potential cornerstone of a rebuild, and in the league in general. A man of many interests, it certainly doesn't hurt his (or Boston's) outlook to have such a perspective so early.